OK - you came here for the fireworks, but there are a couple of things I need you to do before you start playing John Phillips Sousa for the Grand Old Flag. 1. A young friend of our family, who is named "Daniel," is going into surgery on Thursday, 9 May 2012, at about 5 AM, to have a pacemaker put in; his surgery is postponed one week. When I say "young," I mean he's not old enough to drive. Please pray for Daniel and his family, his doctor and the support staff, and that God will be merciful. 2. My beloved friend Mark Lamprecht, known to many of you as "Here I Blog," has a friend who is in dire need of medical treatments he cannot afford. I haven't been given the liberty to share all the details, but I can say that Mark and I are trying to find a way to create a donation campaign for this fellow who is a father and a husband in order that he gets the minimum urgent care he needs, which will be about $12,000 to start. Until I can find a way to make the donations payable to this fellow's church so that we know the funds will be property administered, I'm not linking to a donation site. But for now, if you would be in very serious prayer for this man and his family, it would serve them well. JT:I think the one with [Jefferson Bethke], who is here someplace, I think that one was in some ways an easier thing because Jefferson does not represent a movement per se. He's an individual person doing a video and received some, you know, hurtful comments, and also some iron sharpening iron push back. I think that's in a little bit different category that, say, some of the controversy with Sovereign Grace, or with Elephant Room. Um, so much to say, about both those that could be said. I take a little bit of a contrarian perspective on both of those in that there is so much dialog going on behind the scenes that not everyone is privy to. Take Elephant Room as an example: There was just a lot of conversation going on behind closed doors, private communication, and some of the people in the blogosphere were saying, y'know, "why isn't TGC saying more? Why isn't Carson or Keller saying more?" I think if you're not privy to those conversations, it can seem like stone-walling or sweeping something under the carpet, and y'know, why aren't we being communicated to. Some of that is that we're conditioned to, when there's information, it should be made public. JT: And I think in the Sovereign Grace one, which I think is its own animal, very complicated, but there you have an example with uh, the wiki-leaks sort of mentality and strategy among some people who had left the movement, some who were still in it, just saying, "That's not good enough, we're gonna take this into our own hands. We're gonna go public, make documents public, nothing's off limits." There's literally no ethics involved. The debacle of the Elephant Room, according to the representatives of The Gospel Coalition on the Band of Bloggers panel, was the objections of numerous bloggers, and the criticism of The Gospel Coalition, of which MacDonald was a founding member, for its silence on the matter. We were scolded for expressing opinions without being privy to the inside discussions of The Gospel Coalition, as if that was at all necessary, as if T. D. Jakes was an unknown quantity instead of a public figure whose heresy is well known through multiple publications. Bottom line: if you’re not on the inside, you’re not qualified to speak. Justin Taylor specifically said that this is a bad distortion of what he personally said, and I want to consider that as well as a further issue regarding the problem of transparency and disclosure overall. Let's start where Justin starts: the Jeff Bethke incident which, as he rightly assesses, is an "easier thing". But Justin's assessment is that it was easier because Young Jefferson is just a guy with a YouTube channel. That is: a YouTube Channel that has received 20 million pageviews. Just for comparison sake, "David after Dentist" has 110 million views in 3 years; Jeff has 20% of that in 4 months. At this rate Jeff's video will have 100 million views by next summer and will be parodied by Chad Vader before the Fall. My point being: Justin classes Jeff and his video as "just a guy," when in fact Jeff has captured more viewers than any one time Mark Driscoll has been on national TV. Justin's view is an understatement at best -- and it minimizes what followed. Jeff, who is not a pastor, or the leader of a movement, but who has gotten more views for his video than Jon Stewart gets for the Daily Show in any given 10 days combined, received some criticism for his video -- some of it constructive, some less than helpful. But Jeff did something which, it seems to me, is instructive: he listened and admitted his mistake(s). Of particular use for this teachable moment was the pastoral poking of Kevin DeYoung; Jeff's response to Kevin was, it seems to me, not just edifying but exemplary. Jeff made some clear mistakes, Kevin lined them out clearly and fairly, and Jeff accepted them at face value. Jeff didn't go into seclusion or go into radio silence while urgent and necessary private conversations were conducted for the sake of his soul and the real people who might somehow be damaged. See: Jeff Bethke, when he put his foot in it publicly, took public criticism, and made public amends for it. He even accepted that people criticizing him meant it for his good -- even if some of them were somewhat not good at goodness or at speaking the truth in love. Let me say this clearly: if that's what we receive from a young fella with a YouTube channel, why would we expect less from the heroes of the reformed blogosphere? Let's face it: saying nothing at all is actually less than what Jeff did. Ignoring the public spin of those doing the wrong thing, which were tantamount to lies and obfuscations, is less than what Jeff did. Failing to speak up until all the wrong that could be done was actually accomplished is far less than what Jeff Bethke did. And doing less than Jeff when your position in a movement or in a coalition or in a band of men joined together for some para-church sake is less than what ought to be expected. Yet here's where those I am talking about, and their advocates and surrogates, will start sniffing at the criticism. JT has already hinted at the tactic in his statement, above: not everything has to be public. In fact, as JT said, public statements would hurt the private conversations. Therefore, let's think about the perfect example of that -- the mud fight surrounding SGM -- as it is also instructive. JT, as the insightful and helpful blogger that he is, actually nails it in his statement: what happened to those with the (in my view: unreasonable) hunger and thirst for justice is that they gave up on any kind of ethics in order to make public every jot and tittle of perceived wrong-doing and to demand a pound of flesh because they said they were offended -- and not because there was any substantive offense. One of the greatest factors that inflamed the conflicts and increased people’s wrath and clamor was the extensive use of sinful communication in talking, emails, blogs and meetings. While every Christian would agree that gossip and slander are sinful, many in SGM failed to recognize when they initiated, participated, or listened to and read sinful communications. As mentioned above, AoR has often seen sins of the tongue in conflicted groups. But in working in this situation, we experienced first-hand an unusual severity of this grievous sin. It was simply shocking. 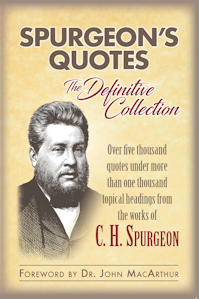 For a people who take pride in humility, who claim to have been totally indoctrinated in biblical peacemaking, and who brag about the way they share Christ and his love, we were saddened that so many of these same people minimized sinful talk, justified gossip and slander, and refused to see how such activity itself exaggerated their troubles. My point being: if this really is the only other choice as what "some bloggers" were demanding, then I agree with Justin: maybe we'd be better off just minding our own business. But, in fact, that's not the only other choice -- and in a very specific sense, it's not what "some bloggers" were suggesting, and exhorting, and pointing out was missing. That's not badgering. That's not unethical intrusion into private conversations. But that's also not one of the choices JT is willing to proffer. See: what is said by JT (and to be fair: I think it is at least partially unintentional, partly a function of unprepared remarks) is that we can expect one thing from a young fellow with a YouTube channel, and we should expect that same thing from people with complaints about their churches, but we can't expect it from men like the guys who sit on the council for the Gospel Coalition. These are important men, and they represent more than themselves, and we can't just expect them to take public rebukes for public misdemeanors and mistakes as if they might actually be wrong. This is why David Kjos was offended by the table talk at BoB2012. In fact, this is why I am offended by this little kaffeeklatsch of fellows under 40 who know things they wish they didn't know: there's no question they have a different standard for a James MacDonald or a D.A. Carson or a Mark Driscoll or a John Piper or a Mark Dever than they do for a Jeff Bethke -- and it's not a higher standard. It really doesn't get better as you listen to this discussion: it gets worse. Collin Hansen, God bless him, pulls back the curtain for us and makes it transparent what this means, ending around 34:50. Again, to be utterly fair, I think he didn't intend to say it this way, but he said what he said. In his view, in the same way that Christianity Today would never publish anything but nice about Billy Graham and his kin, the same barrier exists at TGC for the council and its members. When you link this to Collin's foundering around about what's so bad about comments (negative comments being, on the one hand, welcome for the sake of "openness", but on the other hand, being from "parasites" who don't have any other platform or readers), it's sort of ghastly. It's like finding that darned cat which has been missing for a few weeks behind the appliances -- it's not what one wanted to find, or meant to find, but you have (for good and ill) found it. It answers a lot of questions. But the choices are not to either do nothing or to produce a reality show that runs after Keeping Up with the Kardashians: a real third way could be to be like Jeff Bethke even though one might be James MacDonald or Mark Driscoll. Or better still: specifically because one might be the leader of a movement, somehow one takes Jesus' admonition to be unlike the world but to instead save the world (or your demographical piece of it) by dying for it rather than jockeying for position. The real third way is to be like Kevin DeYoung or Thabiti - to say what is right regarding what is wrong, in a clear and cogent and compassionate and public way so that what is actually wrong with a brother is made clear to those one intended to attract in the first place, and so that what is right about public discourse can be modeled for the plethora of hit-piece writers and undiscerning discernment bloggers. There are more lessons to be learned here than the really-superficial and rudimentary issue that somehow Keller and Carson are aware that Jakes is a Modalist - and those lessons are actually lessons in applying the Gospel. When a James MacDonald publicly embraces, from bad to worse, panderers, demogogues, and then a modalist, the least one can do is say, "I think my friend has made a mistake which, I hope, he will repent of." And the least he can then do in return is to say, "I have received a general critique of what's happening here, and I hope I can resolve it with my friends." And then let all the private enclaves and secret meetings which have jaded and disillusioned these poor young fellows with thoughts that cannot be mentioned ensue. But that cannot be demonstrated because these men are, it seems, too great to be burdened with running the parachurch ministry they sought to build to this high a profile. It's no wonder both James MacDonald and Mark Driscoll got a fond farewell from TGC rather than a sorrowful public final plea to repent of their terrible mistakes: there is a different standard for men like them, and men like Carson and Keller, than there is for men like me. The proper standard, however, will be upheld in the comments, which are open. Play nice. there's no question they have a different standard for a James MacDonald or a D.A. Carson or a Mark Driscoll or a John Piper or a Mark Dever than they do for a Jeff Bethke -- and it's not a higher standard. It's no wonder both James MacDonald and Mark Driscoll got a fond farewell from TGC rather than a sorrowful public final plea to repent of their terrible mistakes: there is a different standard for men like them, and men like Carson and Keller, than there is for men like me. Bingo. Have you ever seen a church in which a member of the board of elders is held to a different standard than a new member in his twenties - and it isn't a higher standard? Boy is that ugly. People start saying things: "It's as though the leaders are above criticism," and "this church is little more than an old boys' club." And of course, those who say such things are right, even if they are maligned as being "divisive." One further thought, TGC is a dead letter until it acknowledges Collin Hansen's remarks and deals with them. Specifically, the top leadership of TGC needs to acknowledge that the culture of double-standards has existed within their organization, explain how it came to exist, and repudiate it for the future. Until they do, it's folly to trust anything that TGC says. It reminds me of Rahm Emanuel's comments about crises. He "pulled back the curtain" on the thinking of the current administration, and until the administration deals with what he said and repudiates that thinking, they will and can never be trusted when responding to any crisis. We know they're working the system. Similarly with TGC, Colin has essentially said, "We really are an old boy's club, and what that specifically means is that while we may be willing to criticize the likes of you shlubs, we'll never criticize any of our own annointed." For TGC to ever have any credibility in the evangelical world, it's leadership is going to have to acknowledge that this was said, explain how that impression came about, and repudiate such a bunker mentality for the future. What is it going to mean for TGC leadership to do this? Does it mean Carson and Keller will have to go? Probably. Nope. I deny it and repudiate the idea that Carson and Keller must go. I'm not talking about political theater here. I'm talking about Christians who have something the Obama administration does not: the Christians have the Gospel. The Gospel says we can repent, be forgiven, and show the fruit of repentance. Just because it has not been done does not mean it cannot be done. The people involved can repent of their double standard and their pride. They don't have to leave their posts or walk around like they are somehow stained - if they come clean and repent. I am offering them the Gospel solution and not the world's solution. It is my prayer they take it. My point was: humanly speaking, what will it take for the organization to repudiate the manner in which it has stifled criticism? Usually this requires a shake-up of leadership. However, you are correct, and it was wrong of me to pretend that "humanly speaking" is the proper way to talk about a group of Christians. My comment lacked faith, and I shouldn't have included that last paragraph. For the record, Tom, I'm glad you said what you said so that the statement could be taken at face value and then responded to. There are a lot of people who would think what you wrote -- and say it in a much more rancorous way. They should think again about the way in which they underestimate the Gospel, if I can say it that way. And I want to repeat this even though I said it twice in the post: I am 100% confident that Justin and Collin were not trying to say what they actually said here when it comes to this double standard. I think they would be appalled to realize that they are administrators of a system like that, and I hope that is in fact what they will think about as this gets around. My view of it, in case there is any doubt, is that they have simply convinced themselves that there are only two ways to go here: voyeuristic sin or utter public silence. I am entirely grateful to a young fellow with a YouTube channel and a pastor with a blog who demonstrated with no sort of duplicity or agenda that there is a third way which is public, truly humble, and exhibits all the ethics we would hope the Christian blogosphere ought to demonstrate -- and still sets right what has ben done wrong. And what better way for leaders of The Gospel Coalition to give testimony to the gospel than by repenting and relying on gospel grace to cleanse them? 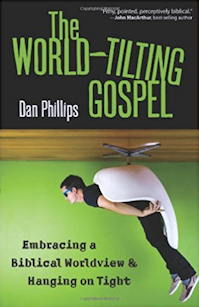 The gospel isn't just a rallying cry for a ministry or for churches....it is to be submitted to in everyday life and this is a great chance for these leaders to model that gospel submission (not to mention showing that they really are all about the gospel itself and not their own influence or ministerial muscle). Failing to speak up until all the wrong that could be done was actually accomplished - yes, and then sniffing disdainfully at those who in fact had spoken up in a timely manner for not leaving it to elite insiders within the dainty clubhouse. Frank, I can't tell you how strongly this post resonates with me. Thank you, brother. How often we become products of our environment. It seems you are saying that JT and the lot are pandering(gently). They are not in their minds a pandering type and are caught in a reality where self inventory is an impossibility. Collins remarks clearly demonstrated that. I'm not sure I can accept the idea that they are pandering. I think, at the end, they are rather trying to find a way to be honorable to men they respect -- forgetting that those men themselves ought to be, as Paul says to Titus, "above reproach" as elders and pastors. It's phony to cite the pastoral nature of blogging and then say that this same issue doesn't work itself out for the leaders of a pan-denominational coalition who, occasionally, blog. Let's not expand the scope of my complaint. There's a double standard in-play, and there simply doesn't have to be. Let's stick with that and see how that is received. What a well thought out and clear post. A very good job of addressing the issues. You stated: "The real third way is to be like Kevin DeYoung or Thabiti - to say what is right regarding what is wrong, in a clear and cogent and compassionate and public way so that what is actually wrong with a brother is made clear to those one intended to attract in the first place, and so that what is right about public discourse can be modeled for the plethora of hit-piece writers and undiscerning discernment bloggers." I think part of the problem of the internet is that sometimes discernment bloggers come across like the Jersey Shore of writing. I hope that the way Thabiti and Kevin DeYoung addressed their concerns gains ground among writers in order that issues get addressed clearly and honestly without as much fanfare and embellishments for show. 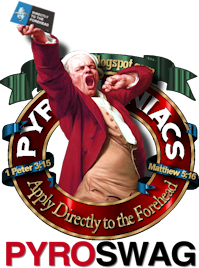 I think these are very serious times, with cracks growing wider in the Evangelical Body and more recently in Reformed circles, and I am thankful for sober minded writers who call for discernment and adherence to the sure Word of God. Thank you for this clear and brotherly analysis. What hopes do you have, if any, for this post to accomplish? Frank, I hope that it it is not received as most things not generated from within the clubhouse are received – in other words, not. If that's true, who is Snookie and who is the Situation? My hope is to have a constructive and open dialog about what was said at BoB2012, and that if I have any fault in my analysis I can be persuaded to repent of it. Likewise, if there is any fault I have exposed for these men, whom I see as fellow Christians and fellow pundits (and in some cases: fathers in the faith), that they can be serious and truly humble and do what is necessary to resolve that. Thank you, Frank. That is my prayer. One last question: As Frank noted, it has been stated several times that there were behind-the-scenes discussions to which the public was not privy. How did those private talks, however serious they may have been, protect the followers of James MacDonald who, because of Mr MacDonalds's leading, embrace Mr. Jakes as orthodox? As someone who was there, let me say that Collin's facial expressions and body language did not convey smugness. I don't know him at all, so it would be irresponsible to read too much into it, but I think they're more conflicted and sad than what comes through on the audio. Discussions about whether TGC response (and their defense of the TGC response) was adequate is one thing, but to jump from there to the idea that they have dishonorable motives is taking it too far. I think part of the problem of the internet is that sometimes discernment bloggers come across like the Jersey Shore of writing. Some of the public outcry I witnessed on Twitter was not iron sharpening iron, but harassment. I can only imagine the tone of some of the private emails they received. I'm still willing to believe they were referencing the shrill, vile outcry more than the thoughtful pushback when they made those comments. Having said all that, it's not that hard to publicly say "So-and-so is my friend, and I love him, but he's wrong." The comment which Collin left for me personally was smug. Realistically, from my perspective, having the private conversations go public would not have improved the situation for the HBC laymen who are in some sense the real victims of all of this. If it's not clear my the things I have written so far on this subject, let me be as clear as possible now: I actually do not want to know what transpired between D.A. Carson and James MacDonald behind closed doors. It seems to me that if the statement issued by Carson and Keller after ER2 was issued in November rather than in late January, the key issues would be plain, and the obfuscations by the parties who eventually left TGC would have been put on-notice and in a proper public light. I absolutely do not want transcripts of private meetings. I just want someone to be honest about what is at stake and what is being worked out. Thanks for the post. Obviously the hoards of reformed celebrity followers will consider you impertinent for making these points; thanks for making them anyway. I'm not sure I could explain why, but when the kind of behavior you are talking about occurs in the world of conservative Christianity (very often and in very high profile), it makes me sad almost to the point of nausea. You seem to do very well at staying positive without denying the negatives. Your last sentence is exactly right, and I appreciate your feedback as a person who was there. I am curious if the thinking at TGC was to emulate a church discipline model. My church spends much time behind the scenes counseling, as much as they are able, a person in need of discipline. It is only after they exhaust that avenue that they bring the person's sin before the Body, even if it has been an obvious sin that the Body has been aware of for some time. When it comes before the Body, it is usually to the point of disfellowshipping the person. I am not excusing TGC on how they dealt with the issues, but wondering if that was their thinking. I wish they had been more honest about the "fond farewells" because that is where they showed a different standard for sure. and where they seemed less than honest. I think many Christians have been stumbled by actions the past few years by respected Christian leaders and again, am thankful that some people have the courage to question and address issues. I really think that TGC and other ministries will regret that they didn't speak up for the sake of younger impressionable Christians down the road when things speed up on the slippery slope. Permit me to apologize. My question was unclear. In no way am I suggesting that those private conversations should have been/should be made public. I was attempting to address the fact that behind-the-scenes discussions did nothing to protect the sheep in the HBF pastures. 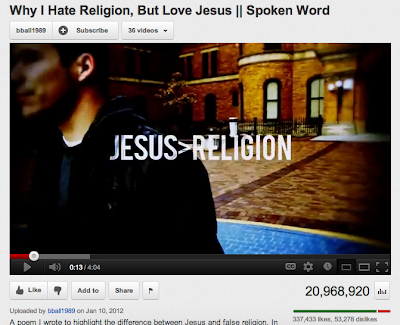 Bethke actually had a much worse version of the "Jesus and Religion" video from a live performance. There was an extra line in there about "the gay-hating Republican Jesus" that people see "on Fox News." That was taken down pretty quickly after the new version went viral. Not sure if that means he genuinely regretted it or just thought is was imprudent to leave it up. Oh yeah, and how 'bout Mark Driscoll? I mean I'm glad his new book finally drew out some negative reviews, but... a lot of this stuff isn't exactly new. Even in actual church discipline situations, this is typically right, but not always right. What if a member of the church is actively going about the church convincing young, new Christians that the doctrine of (oh, I don't know) the Trinity is unimportant. Should the church spend a long time counseling before going public? Or do they privately give a single "cease-and-desist" order, accompanied with, "We'll talk, but if you keep up this behavior you'll be publicly rebuked in a hurry." Not all circumstances are alike. How do you perceive Mark Driscoll's exit from TGC? I'm curious as I think you're a representative generic blog-reader. Double standards involves showing favoritism or partiality between two parties. I think scripture says something about that (James 2:1-4). Collin’s comments do not come as a surprise to most people. By that I only mean the information they convey regarding the way TGC council members are treated, I don’t want to get into the attitude in which it was conveyed as I can’t speak to that . The comments do illustrate that there is a partiality shown to some (Carson/Keller/McDonald/Driscoll) over other brothers and sisters in Christ whose ‘tribe’ is smaller (and therefore less impressive). I think those in leadership positions often face a battle with pride. We all do, but certainly those in positions of authority are presented with that temptation more frequently. That is why we need to pray for our leaders (as we pray for ourselves) that they may be humble and serve those entrusted to them as unto Christ. Jesus certainly taught His disciples the lesson of humility through words and actions. He taught that He came to serve rather than to be served. He taught them that just has He humbled Himself to wash their feet, they too should serve each other. He said that rather than expecting the place of honor at a table, to take a lesser position. If someone in a leadership position cannot or is unwilling to receive a valid, scripturally-based rebuke from someone who may be the least in the kingdom, what does that say about the individual? I actually like your analogy. You are absolutely right Tom. There are different ways to approach church discipline. I am just trying to figure out what TGC was thinking at the time. My pastor would not tolerate false teaching and would immediately address it, but he would still address it privately to the person and if there was no repentence, then he would warn the Church. We actually had a situation where he needed to warn those of us who lived in a nearby town, that a past disobedient ex-member had come back into our town after being away. He wanted us to be aware of past issues. This was a very edifying and thoughtful post. As someone who has read this blog for a long time, and frequently wished you had said the incredibly truthful and poignant things you said in a different way, I couldn't agree more with everything here. I want to have something insightful to say, but I don't think this can be improved upon. I really hope that JT and others will read this, and reconsider how they should instruct their "followers" (for lack of a better term) regarding their public discourse on ER2. In short: I really cannot see how anyone would take legitimate offense by what you said or how you said it. In that respect I suppose I'm the closest to the "tone police" thus far in the comments. Thank you for upholding the practice of the Gospel in this area of our lives. CCinTN makes a fine case, but I think there's something else we have to consider, as in the SGM example: every voice is not an equally-valid source, and not every statement requires a rebuttal. For further clarification, here's the thing: my complaint really is not that TGC didn't respond to me: it is that they did not respond to MacDonald and Driscoll publicly whitewashing the matter of Jakes' theology and involvement. Pastor Keller and Dr. Carson owe me nothing, and my complaints are mine alone. But when, frankly, the expectation from guys on that BoB panel for a blogger like me is to make amends when I step in the dog's business, it's simply disingenuous -- whether intentional or not -- to expect less from men of more influence and assumedly-better character. I think there's something else we have to consider, as in the SGM example: every voice is not an equally-valid source, and not every statement requires a rebuttal. About that, I was just wondering: where is the Anti-CJ militia? I thought they'd be all over this post like fleas on a junkyard dog. If they show up now, Chantry, I'm going to ban them and blame you. Frank, I did not read a lot of material surrounding Mark's actual exit from the coalition, so I don't know how well equipped I am to give an opinion on it. I can only speak more generally about the disappointing/creepy trends Mark's ministry has taken in recent years, and what I perceive as a slowness to respond on the part of fellow pastors/leaders. At this point it's probably for the best that he's gone. For me it boils down to this: The “Council” members did not respond initially (and pitifully afterwards) because of who MacDonald and Driscoll are and the other “Coalition” members (other than De Young & Thabiti) did respond to “you and us” in the way that they have because of who they (the Council members) are. In the end, they have stained the Gospel they ostensibly desire to promote. YES! And you would think a group identifying themselves a Coalition about and for the Gospel would have a better handle on applying it. They missed the opportunity to model for others how the Gospel is practically lived out in the way that we should deal with a brother in error. Now they have the opportunity to model how the Gospel is practically lived out by confessing the error made in not addressing this Biblically and how it should have been handled. I pray they would humbly do so. You've hit it out of the park again (and I wondered what more there would be to say than what was already said). I'm not trying to be cynical when I say that I don't see much happening as a result of this post. I'm glad it's out there on the record for their consideration, but beyond a comment or perhaps a mention, maybe a blog post reiterating what they've already said, I don't see anything changing as a result. Carson was speaking in my area several weeks ago and when asked in the Q&A about the Elephant Room fiasco he had no comment beyond "See the post Keller and I wrote." I remember wondering if they had reached some kind of agreement NOT to talk about it anymore. Sad, because I used to have such respect for all these guys (even the ones younger and/or less educated/experienced than I) and it's hard to see them in the same way anymore. I personally am most disheartened by the fact thank Frank knows anybody(let alone 2) on Jersey Shore. I'm with you, YGG. I have close family members that go to Mars Hill, and I see their thinking slowly line up with Driscoll, while still maintaining their worship of him. Like Frank has said, in a very excellent article, this is a fantastic opportunity to see, especially for us young Reformed troublemakers, Christian elders striving to remain above reproach. Michael Jones, several of my staff guys were at that same meeting with Carson when that question was asked of him... They came back disappointed in his tepid response. Well, now we know why, don't we? There apparently was some "gentleman's agreement" that we just won't go there with MacDonald and Driscoll. "How much is your platform worth to you? Is it worth it to you, as ministers of the gospel (several of you, at least), to be told that you simply may not speak on certain topics? To be told that you must tow the party line? To be put in a position in which, not only are you towing the party line, but everyone knows that you are, because it has been publicly admitted that this is the party line and that you are expected to tow it? Now, admittedly, I've never been in your shoes, because I've never had your platform. But I can't imagine it's worth it. And I suspect you all know someone a bit older than yourselves who concluded that it was not worth it and who quietly stepped away. Maybe you should go ask him for advice on what to do with your platform." Very helpful post, as usual brother. As some of what was discussed here relates to the proper way to divulge private information with public ramifications, I really would love to get your opinions on tell all sites like "www.joyfulexiles.com" which provide a lot of insider information about a pastor's dismissal from Driscoll's Mars Hill Church. Are these types of things helpful? Sinful? I truly want to be above reproach as an elder and as such don't want to promote a site like that if it's inappropriate. I'm personally on the fence concerning its usefulness and those like it. I think the cat analogy in your post is magnificently spot on. When I listened to the BoB2012, it seemed to me to be a group that would rather not get there hands dirty. They would rather just let the peasants of the blog world take out the trash, clean the gutters,tighten the lug nuts, and chase out the dust bunnies behind the fridge. But in the topics they were talking about, it seems more like they were in a crowded alley, gunshots were fired, they figured someone else would call 911 and low and behold the Mayberry police show up (as if their badge doesn't up hold the law like a big city badge). So they show up to talk shop and out comes the cat from behind the appliances. The only problem with this analogy and throwing in my own confusing and lame analogy is this: that cat was never missing in the first place and it answers to "Pyro." That's not very kind. I realize the cat analogy has its own flavor, but to drive to motives the way you just did isn't going to inspire anyone to thing personally and seriously about this issue. I guess I don't know if it was kind or unkind or what kind of motives were being driven at that you perceived. Could you clarify? This is not a baiting question. I really do want clarification. I am a little slower than most. Great post, Frank. It seems that since I've started reading this biography of Bonhoeffer, everything tracks back to it. He didn't hold back in criticizing anybody for trying to work with Hitler because he saw him for the madman that he was. While other pastors and leaders thought they could convert Hitler, Bonhoeffer knew that the proper response was to speak out and take a stand against evil. Now I'm not comparing MacDonald or Driscoll to Hitler, but damnable heresy is a much worse threat than Hitler ever could hope to be and people who teach it should never be embraced by those in the Church unless they repent of it. And when people do so (even unknowingly), then we should be speaking out. And those with the most influence towards these people should be speaking out the loudest so that they can get to the point of meaningful dialogue (public or private). Saying that they didn't want to get their hands dirty, and that they think the other bloggers (whoever they are) are peasants are not kind statements. They speak to the motives of those you are talking about. And Pyromaniacs is not a dead cat behind the appliances. It's more like a stealthy gray mouser that lives in the attic. yeah, but you did pull out the Hitler reference. Points off for that. Yes, but I'll stand by the statement that damnable heresy is a much worse threat. Fear not man who can take your life, but fear God, Who can take your life and your soul. There should have been instructions to pack a dinner for this post. Well done Frank. I agree with you that with regards to the private conversations that went on, we dont need the transcripts or video or anything. We do need something however, for bloopers that happen so publicly the resolution reached needs to needs to be equally if not more public. Or if there is repentance, the repentance should be public enough to inform those lead astray by false doctrine spoken by the guilty party that they were wrong. What does repentance look like on the internet? Deleting a post or comment? This is dangerous, propper repenting rebuking and exhorting are in short supply these days, and the baby sheep will suffer. If im wrong then somebody better hit me with a meat club! I've been dreadfully disillusioned (in man, not God) by this debacle and all I've been left with, as I've pondered these things in my heart over the past 3 months, is that I've never once heard repentance. Never. From Rick Warren to Mark Driscoll, all the way to these guys who made themselves leaders of evangelical Christianity - I've never once heard repentance. I guess 'important' Christians don't repent. They correct and they shut down, but they don't repent. Spiritual cronyism equals fearing man (in this case -colleagues, friends) instead of God. The gates of the orthodox church were breached and the heretic was allowed in, and NO ONE repents? Really? And now parishioners of Jake's church can legitimately stand beside us and say their god is the same as our God is. I have repented time and again to God as I've prayed, that my anger over this would subside; I've called out to Him countless times! I've asked Him for help in this, that my heart would be guarded and not jaded. And God, just as He's promised, forgives me time after time. But oh what I wouldn't give, to just once, just once, see some true repentance from those who teach us about it. I am giving Gabby a standing ovation. I second that standing ovation. Gabby has nailed it. And it's Gabby for the win! No one has repented yet. Let's not lose sight of the fact that "yet" is the space where the Gospel fits in this story. That's true, Frank. And we have not yet repented of many things in our lives that we need to. May God work on our hearts, as well as those of these men. And let us keep hoping and praying for this. How long, oh church, do we wait for them to repent? A year? Ten years? The damage has already been done. How much more collateral damage are they entitled to, while we await their repentance? And, if that repentance never comes? Do we remain silent and hang our heads in sadness? Or do we follow the Biblical instruction regarding those who refuse to repent? I hope this isn't too off topic, but I think it applies. This all is one of the foundational problems with ecumenical movements that go beyond a gathering (T4G) into an institution (TGC). Denominations, church discipline and the like protect us with the biblical practices of discipline from all this kind of craziness. I greatly appreciate The Gospel Coalition's ministry to my own spiritual development, but I think it best to be left at a website with lots of resources, not something to be "joined" with council members and the like. Should the whole "council" thing be dropped and just call it endorsements? Anyway, I've got some local people to get to for some rebuking, so I'll check in later for the public version. I think that silence has not been practiced here. I also think that waiting more than 24 hours for some sign of life after the post goes up is, to say the least, courteous. 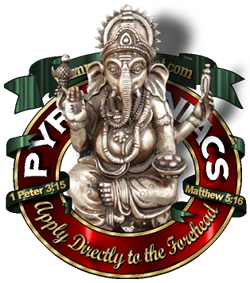 My comment is not merely about you nor the multiple conversations on this topic at Pyromaniacs. To suggest that they've had less than 24 hours to repent is a bit myopic. This issue is much more broad than this blog alone. Care to conduct a little thought experiment with me? Imagine a hypothetical (and so we're clear - this is completely and totally absurd) scenario where, in early September 2011, James MacDonald announced on his blog that in late January 2012, he was going to commit adultery. What do you think the TGC response would have been? Would so many have remained completely silent? When Carson and Keller issued their proclamation, would it be so 'balanced' and 'nuanced' that you had to look really hard to see whether they approved or disapproved, and would the idea of "I guess we'll just have to see how this plays out" have had even the tiniest chance of making it into their paper? And to the point of this event, would we be scolded for talking about things we can't possibly understand (unless we're privy to the triple-secret conversations, of course), even though it's plainly knowable to all that (1) adultery is bad, mmmkay?, and (2) this [imaginary] woman ain't his wife? Would Challies - I think it was him, forgive me if it wasn't - who in the five months between announcement and consummation wrote about 350 blog posts totaling approximately 2,386,428 words (give or take), have said that there just wasn't enough time to think through such a complicated issue, so we should probably just shut up about it and hope for the best? 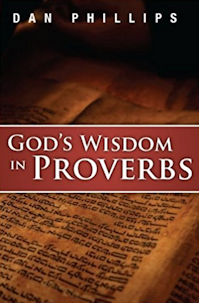 Would Proverbs 18:17 have been invoked to tell us all to shut up until we hear the other side of the case, as if (1) the case wasn't already thoroughly documented and easily obtainable for anyone who cared to look, and (2) there was anything the other side could possibly say to justify such a blatant sin? Would the thought ever enter anyone's mind that "Well sure, he's bragging about committing adultery in public, but he's one of the club, so of course we won't say anything about it"? So why is it that if you change the sin from "adultery" to "promoting a false teacher", all of this and oh so much more not only happened, but is proclaimed as if it's the enlightened, godly way? Thanks for the blog. It is interesting, I've grown exponentially in my faith in the past few years. A huge part of that was being introduced to some of these blogs as I was chewing on how my life should look now that I was fully aware of my own sinfulness. I was edified as I read them, and encouraged to seek accountability and the kinds of relationships that foster an "us" attitude rather than an "I" one. The past few months have been a bit disappointing...but it goes way beyond blogs. In fact, blogs are in a sense victims as much as the rest of us. It's so rare to see the gospel-centered relationships we desire actually modeled out for us. I recently saw a pastor in Lafayette, Indiana get on stage when he was not supposed to be on, to simply apologize for a sarcastic remark he made. He didn't apologize and add any justification to it. He apologized, asked the congregation for forgiveness, and we as an assembly stood up to acknowledge that we forgave him. He said it was brought to his attention by a brother in Christ he has known for years soon after he got done speaking. I had never seen that done before in my entire life, and I was a PK. I grew up in the church. What was most shocking to me after looking back on it, was the hesitance to seek this sort of model in our churches today. We say it's what we desire, but it certainly isn't sought after all that often (with definite exceptions). Instead, when we say that we desire reconciliation, we say that what we want is for people to be ok with what we do and say, and "love us anyway." Others may have said this already, I apologize I didn't have the time to read all the comments, but I think this is just another symptom of major ecclesiological failures that have pervaded evangelical churches in particular. I regularly attend the weekend services and subscribe to the church's email. The HBC leadership has communicated very little to the HBC sheep about any of the issues arising out of ER1 and ER2. ER1 was promoted heavily within HBC, as we were urged to attend, for a fee of course. ER2 was promoted to a much less degree. I didnt attend either one. Nor did I attend the Mens Conference where the scheduled speaker Voddie Baucham was turned away by James MacDonald for what Voddie wrote about TD Jakes. If I didn't read various blogs and articles on internet, I would be mainly clueless that there has been any issue whatsoever with any thing related to ER1 and ER2. As far as I know, the only communication from HBC leadership to the HBC sheep regarding ER2 issues was about 30 seconds long -- in one sermon a few weeks ago (regarding Paul's attempt to reconcile Philemon and Onesimus), MacDonald said that was what he was trying to do in ER2. In regards to the Men's conference where Voddie was denied speaking: it (the Men's conference) was announced and advertised with him being the speaker in the weeks leading up to the conference. In the Sunday service after the Men's conference, it was announced that the Men's conference was great, a tremendous blessing. Nothing was said about Voddie not speaking. Those that didn't attend the conference would have been clueless about the Voddie incident. 3 or 4 Churches have left Harvest Bible Fellowship but nothing has been communicated about this to the HBC sheep from the leadership. We just mainly hear the "good" stuff. Case in point -- check out the promotional video that MacDonald played about 5 minutes before the end of his HBC message last weekend. The video basically communicated that HBC/HBF is abundantly fruitful, blessed beyond measure by God, growing by leaps and bounds, with no end in sight. And by "victims," I mean that in the sense that we are at times byproducts of larger movements, whether we are aware of it or not. Victims of a complete misunderstanding of what reconciliation is and how it looks. We know what it should be, and how it should look, but often times we are comfortable with the theory and timid in the moments where it must become practice. Answer: Because we (and yes, I mean we) tend to love man more than we love God. It is one of our (yep, still mean our) worst sins. And it manifests itself everywhere that we (y'all get it now, right?) care more about sins against our fellow man than about sins against our God and His truth. Indeed. I forgot to link to the But Otherwise repost from a few days ago, but it gets to the heart of it. Adultery (like child molesting) is a plainly obvious sin against another person. Promoting teachers of heresy (like denying Jesus) is intangible - we know it's a sin, we think?, but it just seems so out there. Is it really that big of a deal? And of course thanks for the reminder. It's so easy for me to fly into righteous indignation over this fiasco, and forget to turn the same attention to the sins I commit or cover because of my own idolatry. Don't want to derail anything here ... first off, such a well written piece. A gracious but pointed call to repentance. Now for the derailing. The comment from Robert regarding Bonhoeffer and the comment from Jules asking how long do we wait for repentance made me think that if we just wait 50 years all these guys will be accepted by the evangelical community no matter what they believe! To say that doctrine is important (more so than the fight against Hitler) and use Bonhoeffer as an example (!) shows that our memories for doctrinal purity are fairly short as he was a guy who downplayed the virgin birth, denied verbal inspiration of Scripture and doubted that Jesus was physically raised from the dead. What does the TGC, collectively or individually, owe as a response to Franks interrogatory? TP are neither their pastors, their elders, their fellow local church members nor employers. TP is three guys with a bull horn. An infinite supply of digital ink. TP knows nothing of the internal workings of TGC, of what was said, decided, how it was decided, nor, really, anything at all, other than outside observation and tea leaf readings from parsing comments at a presentation. From this, TP has decided they have both the position (which they do not hold) and the knowledge (which they do not have) to demand sackcloth and ashes. Unless your claiming some special revelation, I don’t see how your demands have any relevance, purpose or merit. I know it no longer graces your sidebar, but what rule was it that stated TP is under no obligation to respond to a poster? And why does that rule not apply to TGC to your screed? Unless of course, TP is really the new magisterium. If so, I can’t wait to see the mitres. Who will get the triregnum? Will that be passed around the three horsemen like the Stanley Cup, or simply reside upon Phil's august head? Will there be red shoes? Think of the merchandising opportunity! Good thing DAC read the comments before commenting. He sure showed us. Then DAC would look like a total idiot. Good thing that didn't happen! Hey, Frank, my cardiologist called; he wants you to ban DAC. I think Frank has done a good job of illustrating an unhealthy and ungospelly inbalance. My hope: Someone at TGC reads the post and stops there to consider without continuing on to the comments. Not that the comments are bad, but I've seen many times where the point of the post is missed because a reader focuses on something in the comments that they find unsavory/unhelpful/curious/whatever. The only reason I keep him around, Tom, is that he's named after my favorite brand of bacon. Tom's cardiologist might have something to say about that, too. Would a paypal account help the donation situation? You know, as we look back on it all now, meaning the ER2, SGM, and Bethke things - and that's really what happened at BoB, a retrospective take - it strikes me as an interesting constellation of events that seem juxtapose against each other in significant ways. It's almost like those three flashes in the blogosphere pan of this last year were providentially timed to shed light on one another, in exactly the ways this post brought out. Well done, Frank. Thanks, rom623rom828. Apparently saying the words, "You are loved," covers a multitude of heresies. Tom, that was funny, tragically so. All we need now is a UNITY song to close out the service -- i mean -- comments here! Frank, I am deeply offended. Repent now. You are a menace who must be stopped. "Thanks, rom623rom828. Apparently saying the words, "You are loved," covers a multitude of heresies." I apologize for being so dense Tom but I just want to be clear on this comment. Are you claiming that James McDonald is covering a multitude of his own heresies or are you claiming that he is covering a multitude of other person's heresies? I am saying that apparently it's OK to swim in a sea of heresies and to encourage others to do so, and then to malign the people who call you on it, so long as you say, "You are loved," because that makes it all good. I have direct experience with this. I am also saying that apparently it is OK to continually fail to teach your people any discernment with regard to truth, or much of anything at a deeper level than mere sloganeering, provided that you regularly say, "You are loved," because again that makes it all good. I have indirect knowledge of this. At the risk of being tagged, at least by Tom, as "anti-CJ militia," I'll jump in (as a 7+ year SGM member) and say that the BoB discussion was weaker than it could have been on the SGM front because I'd argue there's an automatic, long-standing assumption that (a) talking critically -- and I mean that in the positive, discerning sense -- in the conservative evangelical blogosphere about SGM's systemic flaws = (b) slamming CJ, committing slander and engaging in gossip. I'm not sure how it is that folks feel more at ease, analytically, taking James MacDonald to task for ER1 and ER2, while aiming the discernment laser at Mahaney and other members of SGM's leadership for SGM's structural problems and problematic church sub-culture issues is considered, well, taboo. I hope and trust this isn't too closely approaching "ban" territory. All of you who have issues with SGM are unfortunately painted with the brush of those who posted internal documents online and who have, through their actions, suggested that no one can mediate their dispute without first agreeing with all their conclusions. So there is a militia, and even if you aren't one of them, you have to deal with the reaction against them. Add that to the fact that Mahaney's and SGM's alleged sins were of a private and internal nature, while The Elephant Room was a very public affair, and you'll see why some of us don't see the two situations as belonging to the same category. Trogdor posed a hypothetical scenario in which James MacDonald announced his intentions to commit adultery. But, in all seriousness, has MacDonald committed spiritual adultery by his embrace and endorsement of Jakes false teaching? Fair enough. I'd only disagree with one of your points re: private vs. public. There have been many public acknowledgments and, in many cases, public apologies for SGM's systemic problems -- Josh Harris, my own pastoral staff (on multiple occasions, including last Sunday am), even Mahaney himself (at his Pastors Conference talk last November) -- so I wouldn't necessarily classify all of SGM's sins as "private" sins. The question, then, is whether publicly-acknowledged flaws and/or problems in a denomination are, for lack of a better term, "fair game" for concerted, public analysis in the blogosphere. And if the answer to that question is yes, why have we not seen it from the likes of those affiliated with BoB and TGC? Look: finding new ways to say what has already been said about what happened at ER2 may be an interesting rhetorical exercise, but it's not the point of this post. Whether or not CJ and the leadership of SGM have made leadership errors which have created a dysfunctional community is also not the subject of this post. The subject of this post is what it is, and I'm asking we keep it between those ditches, please. Frank -- Agreed. Please know that I wasn't trying to derail the conversation at hand, but I did want to speak to Tom's points and try to keep it connected to the overall post (which, as you infer, does straddle both of the ditches). I can't think of many instances of public, critical analysis in the TGC-related blogosphere when the players have been "in the family." If memory serves me, Justin Taylor did so -- and did it well from what I recall -- back in '05 when John Piper was suggesting changes to Bethlehem's baptism/membership stance, but it's rare. Yes people - come on! - Let's keep this WELL AWAY from talking about CJ and the SGM thing. No need to share your thoughts, of course, because that would mean talking about C* and the whole S*M thing for some non-substantive offence thingy. Did you read the AoR report? #1 Failure of James Macdonald to acknowledge and repent of his mistakes regarding ER1 and especially ER2. #2 Failure of the elders at James MacDonald's "Harvest Bible Chapel" church to deal with #1. #3 Failure of the leaders and member churches of James MacDonald's Harvest Bible Fellowship (HBF) association of churches to deal with #1 and #2. Seems like #1 and #4 have gotten a lot of attention from concerned saints. For #3 a handful of churches have left the HBF association, voicing their concerns. Meanwhile the rest of the churchs in HBF remains silently on board it appears. But what about #2 -- seems like it is way past time for an "Open letter to the Elders of James Macdonald's Harvest Bible Chapel church". I've read the AoR report from start to finish. Plus I've read all of Detweiler's wacky docs (and they are wacky but consistent with SGM leadership culture, I might add), and I've followed the Survivors and Refuge blogs for years. I've also had a number of email conversations with credible witnesses in that time frame. I'm available if you'd like to discuss my take on this. Do you really want to help Allan hijack this thread? Because I don't. Just responding to your question, is all. :-) And I'd be more than happy to have this discussion with you off-line via phone or email. You know I love our time together, Bill. Especially making fun of Jared. My point: this post is simply not about SGM. Sorry! I wish it was -- because enough hasn't been said about that already, especially from people about whom pages 30-31 of the AoR is written (of which you are not one). It looks like a long summer, so I'm sure the SGM thing will come up eventually. When it does, let's talk about it then. Yes, like Bill I've read the entire AoR report (it really isn't that long) AND I've read the Detfiler's docs (it really is that long). Brents docs ALONE are enough to make any discerning person run for the exit door. AND I've been reading sgmrefuge and sgmsurvivors since around 2008. I make that four years. Plus I've been a victim of spiritual abuse. (It's how I came across the blogs) It's real. It's spiritually damaging. I went through whole seasons of anger, wrath, rage and bitterness. It's annoying that what is cited from the AoR report is what they termed the 'simply shocking' behaviour of the people who were complaining that they had been the victims of 'simply shocking' behaviour (by SGM church leaders. If you want any real discernment of SGMs issues (and, yes I agree, you'll need to be alert to some real anger and bitterness) you need to listen to the people who were actually MEMBERS of SGM churches for 5, 10, 15, 20 YEARS. People who were even part of SGMs leadership structures. And they're the ones writing on the blogs. PS - There are 400 plus comments on the AoR report here: http://www.sgmsurvivors.com/?p=3525&cp=all#comments Some discerning stuff especially about AoR's utter shock at the anger and raised voices and clenched fists of the people they were interviewing. That is: an example of resorting to unethical behavior because one thinks one is on a mission from God.